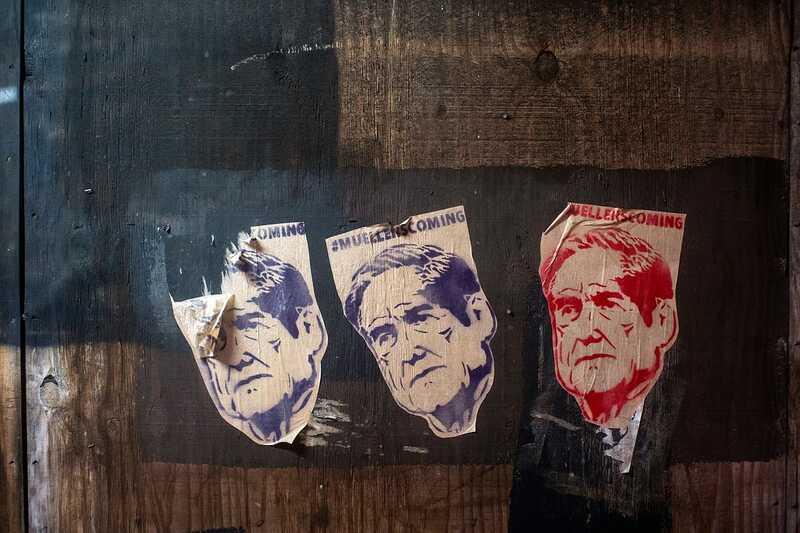 Over the weekend, the Times tried to soften the emotional blow for the millions of Americans trained in these years to place hopes for the overturn of the Trump presidency in Mueller. As with most press coverage, there was little pretense that the Mueller probe was supposed to be a neutral fact-finding mission, as apposed to religious allegory, with Mueller cast as the hero sent to slay the monster. By June and July of 2016, bits of the dossier compiled by former British spy Christopher Steele, which had been funded by the Democratic National Committee through the law firm Perkins Coie (which in turn hired the opposition research firm Fusion GPS), were already in the ether. Comey was right. Wecouldn’t have reported this story without a “hook.” Therefore the reports surrounding Steele technically weren’t about the allegations themselves, but rather the journeyof those allegations, from one set of official hands to another. Handing the report to Trump created a perfect pretext. Why would real security officials litigate this grave matter through the media? Why were the world’s most powerful investigative agencies acting like they were trying to move a stock, pushing a private, unverified report that even Buzzfeed could see had factual issues? It made no sense at the time, and makes less now. Buzzfeed’s decision exploded traditional journalistic standards against knowingly publishing material whose veracity you doubt. Although a few media ethicists wondered at it, this seemed not to bother the rank-and-file in the business. Buzzfeed chief Ben Smith is still proud of his decision today. I think this was because many reporters believed the report was true. We were meant to believe the Russians, across decades of dirt-digging, had an empty kompromatfile on Hillary Clinton, to say nothing of human tabloid headline Bill Clinton? This point was made more than once in the reports, as if being emphasized for the reading public. For years, every hint the dossier might be true became a banner headline, while every time doubt was cast on Steele’s revelations, the press was quiet. Washington Post reporter Greg Miller had a team looking for evidence Cohen had been in Prague. Reporters, Miller said, “literally spent weeks and months trying to run down” the Cohen story. The celebrated Watergate muckraker – who once said he’d succumbed to “groupthink” in the WMD episode and added, “I blame myself mightily for not pushing harder” – didn’t push very hard here, either. News that he’d tried and failed to find collusion didn’t get into his own paper. It only came out when Woodward was promoting his book Fear in a discussion with conservative host Hugh Hewitt. In its FISA application, the FBI included both the unconfirmed Steele report and Isikoff’s September 23, 2016 Yahoo!story, “U.S. Intel Officials probe ties between Trump adviser and Kremlin.” The Isikoff story, which claimed Page had met with “high ranking sanctioned officials” in Russia, had relied upon Steele as an unnamed source. There were so many profiles of Steele as an “astoundingly diligent” spymaster straight out of LeCarre: he was routinely described as a LeCarre-ian grinder, similar in appearance and manner to the legendary George Smiley. He was a man in the shadows whose bookish intensity was belied by his “average,” “neutral,” “quiet,” demeanor, being “more low-key than Smiley.” One would think it might have rated a mention that the new “Smiley” was cutting and pasting text like a community college freshman. But the story barely made news. This has been the main reportorial difference between Russiagate and the WMD affair. Despite David Remnick’s post-invasion protestations that “nobody got [WMD] completely right,” the Iraq war was launched against the objections of the 6 million or more people who did get it right, and protested on the streets. There was open skepticism of Bush claims dotting the press landscape from the start, with people like Jack Shafer tearing apart every Judith Miller story in print. Most reporters are Democrats and the people hawking the WMD story were mostly Republicans, so there was at least some political space for protest. true…? Well, tell me a political issue where that doesn’t happen. I think that’s looking at the wrong end of the telescope. The worst stories were the ones never corrected. A particularly bad example is “After Florida School Shooting, Russian ‘Bot’ Army Pounced,”from the New York Times on Feb 18, 2018. The piece claimed Russians were trying to divide Americans on social media after a mass shooting using Twitter hashtags like #guncontrolnow, #gunreformnow and #Parklandshooting. It wasn’t until three years later, in 2004, that Times reporter James Risen definitively killed the Atta-in-Prague canard (why is it always Prague?) in a story entitled “No evidence of meeting with Iraqi.” By then, of course, it was too late. The Times alsoheld a major dissenting piece by Risen about the WMD case, “C.I.A. Aides Feel Pressure in Preparing Iraqi Reports,” until days after war started. This is what happens when you start thumbing the scale. Failure to ask follow-up questions happened constantlywith this story. One of the first reports that went sideways involved a similar dynamic: the contention that some leaked DNC emails were forgeries. This posture has all been couched as anti-Trump solidarity, but really, did former CIA chief John Brennan – the same Brennan who should himself have faced charges for lying to congress about hacking the computers of Senate staff – need the press to whine on his behalf when Trump yanked his security clearance? Did we need the press to hum Aretha Franklin tunes, as ABC did, and chide Trump for lacking R-E-S-P-E-C-T for the CIA? We don’t have better things to do than that “work”? Such was the case with Jonathan Chait’s #Russiagate opus, “PRUMP TUTIN: Will Trump be Meeting With his Counterpart – or his Handler?” The story was also pitched as “What if Trump has been a Russian asset since 1987?” which recalls the joke from The Wire: “Yo, Herc, what if your mother and father never met?” What if isn’t a good place to be in this business. I didn’t really address the case that Russia hacked the DNC, content to stipulate it for now. I was told early on that this piece of the story seemed “solid,” but even that assertion has remained un-bolstered since then, still based on an “assessment” by those same intelligence services that always had issues, including the use of things like RT’s “anti-American” coverage of fracking as part of its case. The government didn’t even examine the DNC’s server, the kind of detail that used to make reporters nervous. An earlier version of this story claimed Miller personally went to Prague. In fact, it seems the Post just sent reporters on the ground in Prague to hotels in search of Cohen.